Robin's Eccentricities: Butter too hard? I am not a butter fan. Except for baking. When a recipe calls for butter it has to be real butter. To me there just are no substitutes that give the same flavor or texture. On the other hand my husband loves butter! He eats it on almost everything. 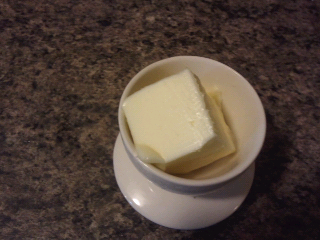 It's okay to have cold butter if you're putting a pat of butter on something hot. If you however want to butter a slice of bread or a roll cold butter is impossible to spread. I was not comfortable leaving butter on the counter. I could for a day but after that I was too worried about spoilage. I began to search for a solution and came across an article on the butter bell. 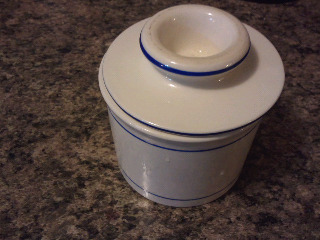 It is a late 19th century French designed crock has two parts: a base that holds water, and a cup to hold the butter which also serves as a lid. This method will keep butter for around a month provided it is kept at temperatures below 80F and the water is changed every two to three days. 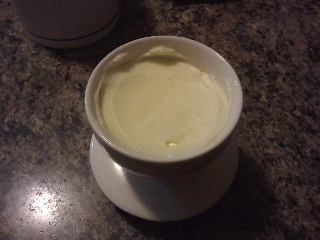 Place 1 stick of semi soft butter into the cup. 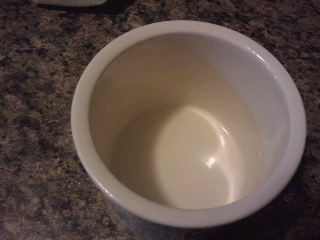 The butter is packed down into the cup. Add cold water to about 1/3 full. 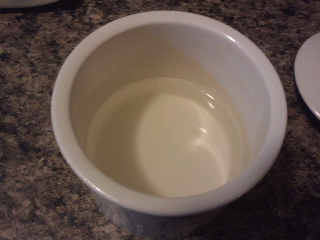 The cup containing butter is placed into the base. And that's it. The water creates an airtight seal that keeps the air (oxygen) away from the butter so that refrigeration is not needed, and the butter can be used in its soft form. Problem solved! Well mostly solved. This works well for store bought butter. I make homemade butter a lot and it will only last for a week or two and the water needs to be changed daily. Want your own? There are several companies that offer them at some pretty high prices. To their credit you can get them in different colors and designs. I like the French look of the one that I have and you can get it here for 1/3 the cost of the others. Click HERE to check it out.